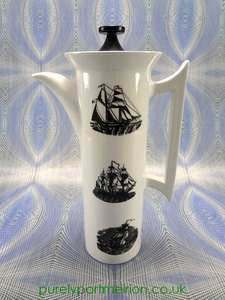 A Fabulous Ted Baker For Portmeirion Tall Coffee Pot In The Rosie Lee Design, Buy Now From Purely Portmeirion. 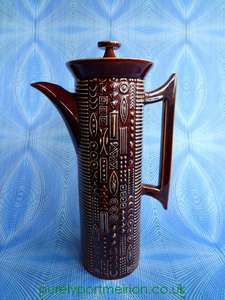 This is a wonderful tall coffee pot from the exciting new Ted Baker for Portmeirion Rosie Lee Design. In a beautiful presentation box. The coffee pot is 1.25 litres (44 fl oz) in capacity and made from fine bone china and hand gilded in 22 carat gold. Renowned UK designer Ted Baker has collaborated with Portmeirion to create this new design called ‘Rosie Lee’. 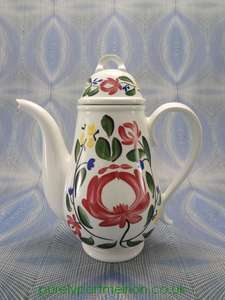 Combining one of Ted Baker’s stunning floral vintage-style print designs and placing it on the modern recreation of Susan Williams-Ellis’s iconic 1960’s coffee pot, Portmeirion have created, in my personal opinion, a true design classic. Continuing the ‘mix & match’ approach that Susan pioneered back in 1970’s when she designed ‘Botanic Garden’, this collection meets all of her aesthetic criteria. The whole range of delicate and delightful tableware has been made from fine bone china, decorated with floral prints with various pastel coloured grounds and topped off with fabulous 22 carat gold gilding. Each piece comes beautifully boxed with dual branding of both Ted Baker and Portmeirion. This is truly an inspirational design combination and one that will make collectors drool with delight. ‘Rosie Lee’ is a fantastic collection that would make a perfect engagement or wedding present for today’s generation that so admire the ‘Vintage Look’.